Paul Janman and I went to the University of Auckland's School of Architecture to give a guest lecture a couple of months ago. In one of the school's shadowy, open-plan buildings we met with Bill McKay and his students, who were together researching the architecture of the Pacific. I showed the students slides of a series of buildings raised by innovative religious and political movements, like the campus of the 'Atenisi Institute founded by Tongan pro-democracy campaigner Futa Helu, the psychedelic shack of the Seleka Club, Tonga's movement of kava drinking artists, and Fanafo, the utopian village that prophet and politician Jimmy Stevens had his followers hack out of the bush of Espiritu Santo in the years before the independence of Vanuatu. After the lecture, Paul and I talked with McKay and his students. The teacher explained that he and several of his charges were trying to count and catalogue the churches of Tonga. This seemed to me then, and still seems to me know, a recklessly ambitious task. Tonga is, after all, the most religious nation on earth, and its galaxy of Christian denominations multiply and divide more quickly than a junior maths champion. 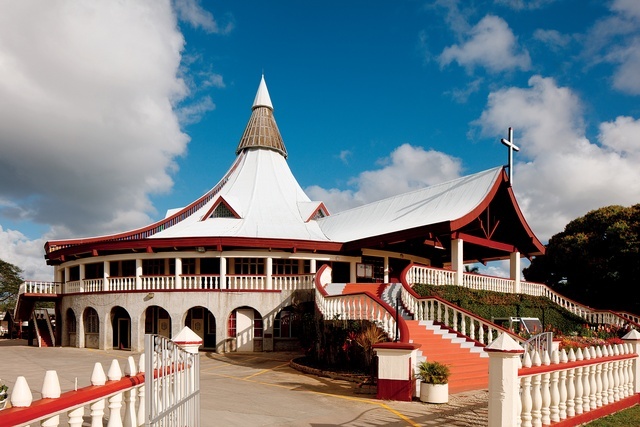 This month Bill McKay has published an article in Architecture Now that includes descriptions of one of the most remarkable Tongan churches, the Catholic cathedral of Nuku'alofa. It is marvellous to think that the cathedral's creators, who lacked any formal training in architecture, are gaining new admirers.